The impact of the recently imposed Chinese Green Fence on the trash produced in American cities was covered recently by Quartz. But what impact could it have on Australia? First up, the Chinese Green Fence. We have very effectively exported the energy, water and environmental impact of processing waste from our own countries to developing countries – whether its e-waste, plastic or paper there is an energy, water and toxic chemical impact of recycling these products. China over the last few years has become more and more aware of the environmental impact of processing our waste. And they have recently established what they have called The Green Fence to try and minimise the impact of our waste on their country. The Green Fence sets out minimum standards on the cleanliness of the waste plastic (fair enough thats what we do), they have set standards to say that if an illegal piece of rubbish is hidden within the plastics bundle then they will reject the bundle (fair enough thats what we do) and finally they are establishing a register of approved recyclers, if they are not approved they cannot import our rubbish (fair enough thats what we do). So the Chinese Green Fence is just bringing their regulations up to equivalent standards that we have. Whoa, that means they expect the same from us as we expect from ourselves. 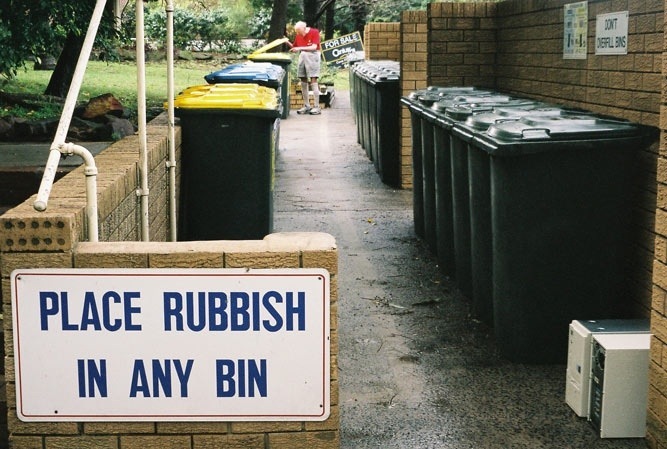 Anyway, way to political for a story on rubbish. Next up, the impact on US cities. The Chinese buyers have stated that they can’t accept certain types of plastics mixed in with other types of plastics – ie non-recyclable plastics mixed in with recycled plastic. Just like we have in Australia, if a plastic bag is mixed in with milk and juice cartons the company can’t accept the plastic bag OR the milk and juice cartons. What Orgeon is up in arms about is that they now have to sort through their stockpile of existing plastics to take out the non-recyclable plastic. Which they would of had to have done if they recycled it themselves. But, and this is where the potential impact for Australia comes from, the average US citizen has not needed to worry about separating plastics because China took any kind of mixed plastic AND they have let the investment in their own recycling plants fall by the way side. According to a report from Resource Recycling, Portland Oregon there haven’t been any new PE recycling facilities opened in the US since 2003 compared to the 4000 plants opened in Asia in the last year. So the drop off in Chinese demand for mixed plastics waste from the US, coupled with a lack of investment in recycling plants could have huge cost implications for American cities. The final note, what does it mean for Australia? Well, we do like to follow the American models. According to the Plastics and Chemicals Industry Association 2011 survey, we are heading in the same direction. In 2010-11 we exported over 50% of our recycled plastic waste, up from 36% in 2001. How could it impact Australia? 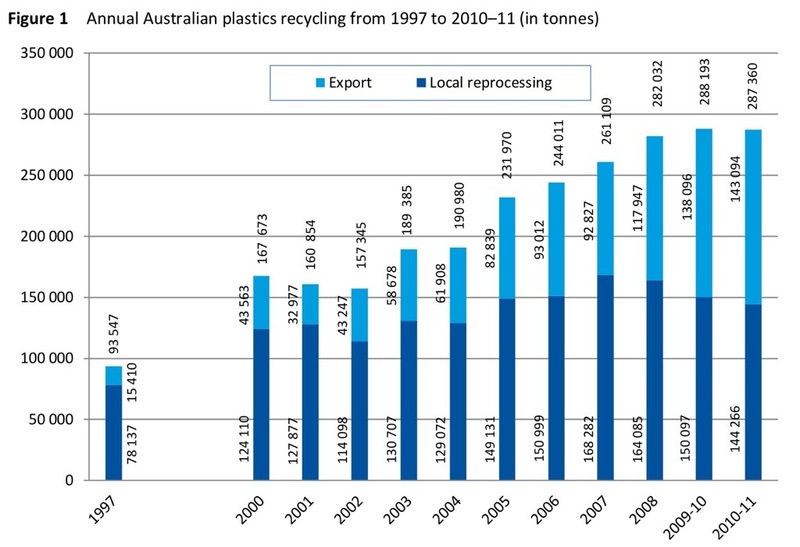 Well its cheaper to process the recycling of plastic in China compared to Australia, for now but probably not for long. China is starting to set rules and regulations similar to the developed world, cost of resources and energy is increasing in China and salary levels will need to increase to perpetuate the domestic market. So similar to the US, the impact could be huge. Especially as we are running out of landfill! On a positive side, we have been increasing the amount of recycling, up from 11% in 2001 to 20% in 2011. But we are consuming 1.4 million tonnes of plastic every year, so with a 20% recycled rate thats a lot of plastic going to landfill. OK I struggled to finish this on a positive note, sorry its not a pretty picture. We really need to look at Waste to Energy more seriously. There are far better ways of meeting our energy demand of course, but, there is room for a little bit WTE. Plasma-arc gassification can deal with some pretty nasty waste which just can’t be recycled. Some plastics can be converted to biodiesel using pyrolysis http://youtu.be/hZ6Rv6hERfY – I’m not sure how clean these processes are but for every tonne of end-use plastic there is an opportunity to produce 800 litres of biodiesel. Too good to be true? I don’t know but it’s certainly worth investigating! Great post! I hope you don’t mind but I’ve reposted this to my blog! In WA The Greens recently launched their Energy Plan for the State and I questioned them on why Waste to Energy Technologies were completely absent from the plan. I’m interested in Plasma-arc gassification and pyrolysis but I haven’t done any proper research as yet. It was disappointing the Greens didn’t do any either – it was certainly an opportunity missed. Even if The Greens had done some investigation which resulted in WTE not being viable for whatever reason, that would have been something – it didn’t even warrant a mention in the report. The response to my question was “it just doesn’t seem right to burn stuff!” from their consulting engineer. Hardly the result you would expect from some academic research! Hi Colin, I’ve done the research and have the technology – there are many different systems available handling rubbish – as your video shows plastic evaporating and condensing into fuel, and there are many to choose from. “it just doesn’t seem right to burn stuff!” just shows how ill-informed they are… of course your video shows it doesn’t burn anything! How easy is it to find a youtube video like this, and how awkward an engineer says something so incorrect when the information has been around for at least 5 years… is laughable. Actually the technology was always existing, not quite back to caveman, but the process of making biochar is the same technology only adapted. Maybe they are just not very smart. BTW, of course there are many waste-to-energy systems being implemented in Australia, mostly landfill to gas. Hi Simon, with the right technology we can now process any waste into energy. Simon, it’s not what happens if China stops taking our rubbish and how it could impact Australia // it’s China stops taking our rubbish LEADS TO A BIGGEST OPPORTUNITY for Australia to turn rubbish into treasure. Thanks for the comment and I couldn’t agree more. Sometimes the biggest opportunities are the ones that are presented as barriers. Its what happens next that is important. The days of “cheap outsourcing” to China, are coming to an end! Chinese made products will soon also start to get more expensive. Very much so, and interestingly the days of ‘cheap outsourcing’ to China are starting to happen. Check out my post on China importing pigs from the US.